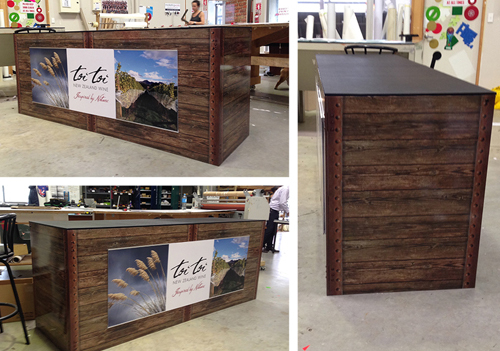 Toi Toi wines, one of New Zealand’s premium boutique wineries, approached us to build a custom display table for the upcoming Taste of Auckland festival. The brief was to build something that not only fit with their brand, but was easy to transport, set up and had plenty of storage room for their wine. The result was a two piece table made from 12mm signex that locked together with a corflute slider system on the front so they could change out the imagery depending on the event. The top was wrapped in a satin black and covered with a floor laminate to give it longevity, then the whole thing was wrapped in a custom vinyl, designed and printed in house, to give it that vintage look. Tne back remained open to give plenty of space for the samplers to store product. All in all a great result. The piece functioned well and sat nicely with the brand at Taste Auckland, with many more tasting’s to come. So if it’s a one off custom piece you’re looking for to promote your business, give us a call about bringing your ideas to life.